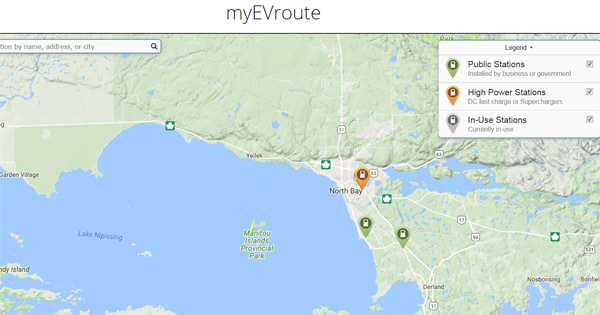 My colleague and early Canadian EV adopter Mike Brigham reported 30 November that he spent an unplanned night in North Bay, Ontario when a DCFC station wouldn't charge his Chevy Bolt EV. North Bay is 360 km (220 miles) or about four hours north of Toronto, the provincial capital. Brigham was enroute from Timiskaming a further three hours and 250 km (150 miles) north from North Bay when he stopped to recharge. There were no other fast charge options within roughly 160 kilometers (100 miles). The DCFC station was part of the MyEVRoute network in Canada and is located at a Tim Hortons, a donut shop found throughout the country. There is only one fast charger at the site. Because of power limitations, the charger is limited to 35 kW. The station in North Bay was the second station in the network that Brigham had trouble with and on 2 out of 3 occasions with MyEVRoute stations he couldn’t charge his Bolt. Another station had a broken latch on the charger handle which nobody had reported. Complicating matters, Brigham couldn't release the charge cable from his Bolt after the charge failed. Fortunately, a motel was within a few hundred meters. To Brigham's embarrassment, the nearby Chevy dealer’s service manager was able to remove the plug from Brigham's vehicle the next day without any problem. The cable was under some tension and the service manager may have compensated for it and released the plug. Brigham had tried this but didn't force it. Or the charge cable lock could not have released when the charge failed. Brigham is a sophisticated driver and knows his vehicles. He's also manager of SolarShare one of the largest if not the largest developer of cooperatively-owned solar power projects in North America. Brigham noted as well that the scanning of bar codes at many chargers seems to be problematic and that an RFID card for each network is the sure-fire solution to logging on. I myself was nearly stranded in Gorman, California when a CHAdeMO station and my Nissan Leaf failed to release the connector. Gorman is not a place you want to be stranded. 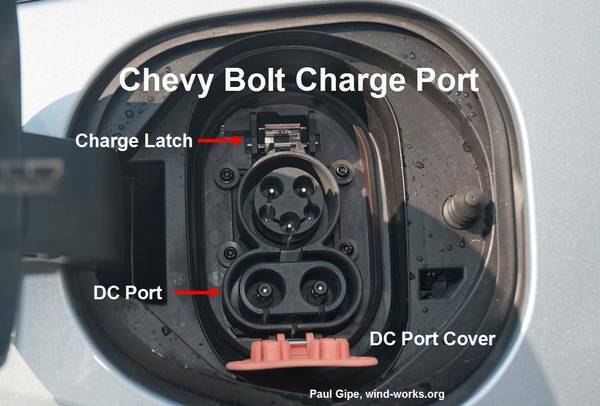 In an ensuing discussion on mychevybolt.com, Charge port locking settings?, one message noted that on page 26 of the owner's manual it clearly states that the station will lock the charge port. "Once charging, the DC vehicle plug will be locked to the DC charge port and cannot be disconnected while charging is active." You can stop the DCFC charge at the station's controls or inside the vehicle by using "the stop charging button on the Charging screen" says the manual. When the vehicle no longer needs to use power from the charging station, it will stop charging and the DC vehicle plug will be unlocked from the DC charge port. Energy can still be consumed from the charging station when the vehicle’s displays and indicators show that the battery is fully charged. This is to ensure the battery is in optimal temperature operating range to maximize vehicle range. 1. Wait until the charging process has been fully stopped, the vehicle plug is unlocked, and the Charging Status Indicator is solid green or off. 2. Unplug the DC vehicle plug from the DC charge port on the vehicle and close the dust cover. 3. Close the charge port door by pressing firmly in the center until it latches. 4. The Electric Parking Brake should be manually disengaged before driving the vehicle. 5. To start another DC charge, remove the DC vehicle plug and reconnect." Brigham's experience is a commentary on the state of the charging network in Ontario, Canada and on the complexity of fast charging. Newcomers to the Chevy Bolt, such as myself, should keep Brigham's experience in mind when taking a road trip.